This picture was taken by the very talented Saralú . Please make sure you visit her Flickr page , you won't regret it!! 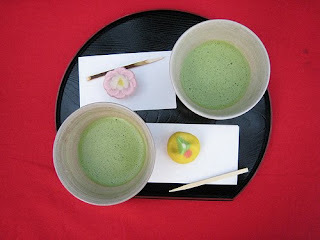 The tea ceremony is probably one of the most beautiful Japanese traditions, there are certain rules to follow though. The preparation of the tea and everything involved with it, is considered an art, so the one who drinks has to show respect to this art. It takes a lot of hard work and studying to learn everything you must know and do during the tea ceremony, but as foreigners we are not expected to know it all. The cake has to be eaten first. Usually they bring it before the tea so you will have no problem with that, but even when they serve both together, you must always eat the cake first. To eat the cake, you must place it on the palm of your hand along with the tissue paper it sits on and cut it into quarters with the wooden stick provided. Poke a piece with the wooden stick and eat it, then the next and so on. Do not poke the cake before cutting it, it’s considered very rude and a reflection of bad manners. The bowl of tea will be served to you with its patterns facing you. Without changing the position, take it with your right hand and put in on your left palm. Once it’s there, you should turn it clockwise in two steps, until the pattern is facing the opposite side from where it first was. The tea is served in such quantity that you’ll be able to drink it all in 3 or 4 large sips, though it’s fine if it takes you more than that. Make sure you drink it all and you leave no foam in the bowl. Once you’re done drinking the tea, you should clean the spot from where you were drinking with your fingertips and dry them on a tissue. This is a short summary I made of the instructions they gave us at the teahouse of Hamarikyu Garden in Tokyo. If you want to know more about it, please visit my YouTube Channel to see my latest video from Japan, which is also the last of the series. I will keep posting content to my YouTube Channel, so please keep checking it out. Thank you for watching and I hope you enjoyed and this was helpful/interesting for you. espero visitar algun dia este pais , esta tan lleno de cultura y tradicion! Would you really want to miss this? !